This album is published by Le Patrimoine Champérolain, a Swiss preservation organisation based in Champéry. The scenario of the story is written by Fabrice Clément. The book was published to celebrate the 10th anniversary of the ‘Patrimoine Champérolain’. The album ‘Champéry, été 1863’ consists of two parts, giving a detailed insight in life in 19th century Champéry. The first part is the comic by Fabrice Clément and Cosey, telling about a certain Gustin. Born in 1780, he joins Napoleon’s army. 50 years later (after surviving battles and a forced Russian exile), in 1863, he returns to his home town. 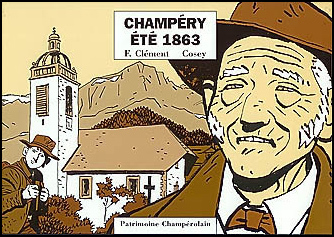 The second part consists of explanatory notes about the history, traditions and environment of Champéry. The comic has 28 ‘half’ pages, also known as ‘italian’ format. The album is for sale only at the Tourist Office of Champéry and Champéry’s local book store ‘Dents du Midi’. 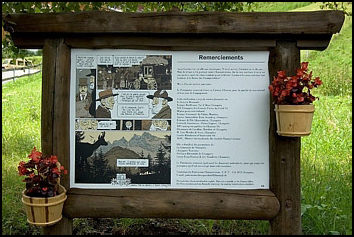 The pages of the book are put on boards throughout the village of Champéry, forming an open air museum. Here an example of the last board.